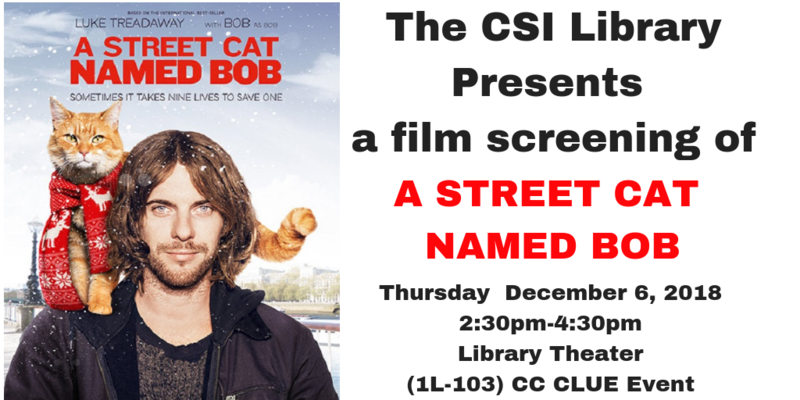 Our December pick for the CSI Monthly Film Series is A Street Cat Named Bob, starring Bob the cat as himself! Based on the international best selling book, this is the true story of how James Bowen, a street performer and recovering drug addict, had his life transformed when he met a stray ginger cat. Thursday, December 6th at 2:30pm in the Library Theater (1L-103). This is a CC CLUE event. appointment with a subject specialist.